With the exciting conclusion of the 2009 Drum Corps International Tour still fresh in our memories, DCI is already gearing up for next year and very excited to once again present its annual World Championships from Indianapolis! 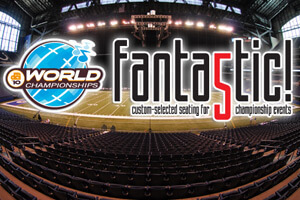 FANtastic 5 Ticket Packages will include five exciting championship events featuring performances of the World and Open Class corps, all from the comfort of Lucas Oil Stadium. Thursday, August 12, 2010 FANtastic Event 1 - World Class Quarterfinals (Reserved Seating) Friday, August 13, 2010 FANtastic Event 2 – Open Class Semifinals (General Admission) FANtastic Event 3 – World Class Semifinals (Reserved Seating) Saturday, August 14, 2010 FANtastic Event 4 – Open Class Finals (General Admission) FANtastic Event 5 – World Class Finals (Reserved Seating) With next year's Championships a mere 300 some days away, take this early opportunity to grab the seats you want for this always-exciting series! Learn more about FANtastic 5 packages and order today.